Ballymena United’s Denver Gage is living the dream after scoring against Ballinamallard United at the Showgrounds on Saturday. Life long United fan Gage is in his second spell with the club and was delighted to be among the goals in the 4-0 victory. “When I left the first time I always thought I would be back. I am just glad to be playing because on the second day of preseason I hurt my calf muscle. “But I got myself back to fitness and I have been fine since three or four weeks into the season. However the team went on their unbeaten run, so I had to sit tight, train hard and wait for my chance. “It is hard because I am a supporter and you want to see the team do well, but I wanted to get in the team. “It is hard not being in the team as you feel you are not doing anything. It is tough - so it was good to start today, get the goal and the team won as well,” he added. And Gage says it was great to see his header fly into the Ballinamallard goal. “It was great for me and it was great for my family.I was at my sister’s wedding on Friday and loads came to the match, so it was great to score. “My family are great because I train Tuesday, play for the reserves Wednesday and then train Thursday. It is tough going with work and a young baby so it was nice to score and” have the family here,” he added. And Gage knows that away to Ards on Saturday will not be easy. “They have beaten us twice already this season. They are a good side and they are very hard to beat at home. Niall Currie has them well organised but we will go there looking to do a job,” said Gage. Meanwhile, manager David Jeffrey was pleased man after the 4-0 victory against the Mallards. 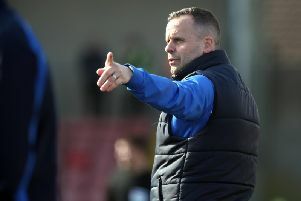 Jeffrey was relieved to get points on the board after watching his side’s recent defeats to Glenavon and Ards which undid their 10-match unbeaten run. “The difference was we did our basics well and Ross Glendinning made a great save and Johnny Flynn made a great block on the line. “If we do the basics well we will score goals and win matches,” he added.